Singapore’s offshore and marine sector has grown from strength to strength through the years, transforming from a simple ship repair and building centre in Asia, to one of the world’s foremost leaders in the field. While the current global economic slowdown and record low oil prices are dampening the outlook for the sector, the Republic is finding new ways to navigate the choppy waters and set sail for stronger growth. Already a regional ship repair and building centre in its early days of independence, Singapore has since built itself up to become a major player in the offshore and marine industry globally. With international clients from all corners of the globe, the Republic is today a leading ship repair and ship conversion centre, with the largest market share for the building of jack-up rigs and conversion of FPSO (Floating Production Storage and Offloading) units. 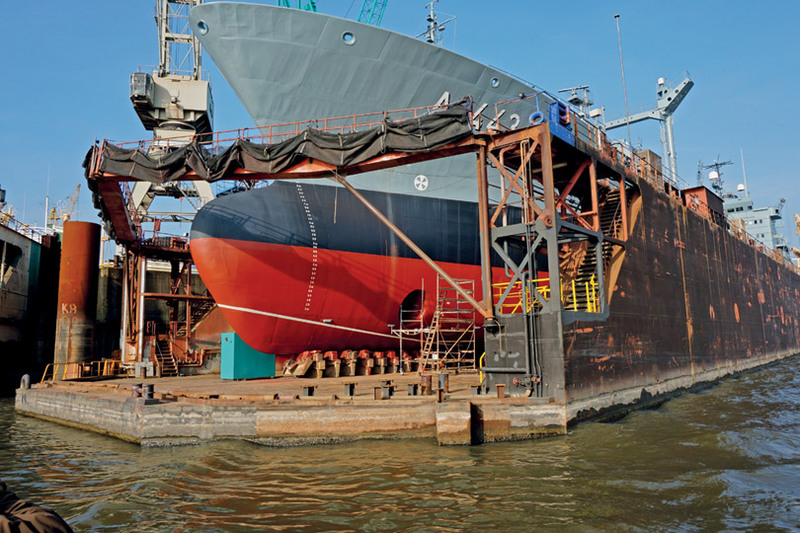 Singapore is also a niche player in the construction of customised and specialised vessels. With Singapore rising from a small regional player to a global leader in the field, its offshore and marine sector has also transformed into a key pillar of the country’s economy, contributing some 2 per cent of the Republic’s GDP (Gross Domestic Product) today, on top of providing numerous good jobs to Singaporeans. The industry here mainly encompasses ship building and repair, as well as rigbuilding and offshore engineering. The Republic also supports a full ecosystem of marine supporting services, as well as being a one-stop marine centre for shipowners, managers and agents, generating an annual turnover of close to S$10 billion. The global offshore and marine sector has seen reasonably strong growth in the years following the international financial crisis. This is largely due to a confluence of factors such as improving economic and trade conditions, a global commodities boom, as well as high oil prices stimulating further exploration and production. However, the global outlook has changed considerably in the last 12 months. The global powerhouse that is China is experiencing slowing economic growth, even while it is embarking on an ambitious path of economic reforms. This has had a knock-on effect on global trade and commodities demand. Meanwhile, a mismatch between abundant oil supply and lacklustre energy demand has resulted in a plunge in oil prices, and oil and gas exploration activities grinding to a halt globally. For the offshore and marine sector, the net results of these developments has been an increase in the number of project cancellations and contract delays, against a backdrop of fewer new orders. Meanwhile, Singapore is also undergoing an economic transformation of its own on the domestic front. Through a reduction in foreign manpower supply, the Singapore government has been encouraging local businesses to increase labour productivity, while making the shift towards economic value creation. Having already started a few years ago, the economic transformation has been gaining momentum, with local businesses getting onboard the bandwagon. With the offshore and marine sector beset by such a multitude of troubles, it can be easy to lose sight of the bright spots that still exist. Speaking at the Association of Singapore Marine Industries (ASMI) anniversary dinner in October 2015, Senior Minister of State for Transport Josephine Teo addressed these points to a gathering of industry professionals. She noted that the Republic’s industry remains robust, underpinned by strong fundamentals and a strong order book. Furthermore, the industry can also leverage on its expertise in offshore conversions and repair to make further inroads into the Floating LNG Vessel (FLNGV) sector. For example, Keppel Shipyard was awarded a contract worth over US$600 million to convert an LNG (liquified natural gas) carrier into a FLNGV. This was their third such project. Given a global shift to cleaner fuels such as LNG – as well as Singapore’s own ambitions to become a regional LNG trading hub – there are definitely opportunities in this sector to be realised. One of these is the niche market segment for the repair and maintenance of LNG vessels. It is in this area that Sembawang Shipyard is recognised globally as a leader for LNG vessel repairs, refits, and life extension works. Meanwhile, the Marine and Offshore Technology Centre of Innovation (MOT-COI) – established since 2006 – has also been helping companies with more than 150 technology adoption projects. One such project resulted in the development of an automated machine to service old, used and rusted scaffold couplers. On the talent development front, the government has also launched the SkillsFuture Earn and Learn Programme for Marine & Offshore Engineering. This year-long programme allows candidates to gain a specialist diploma in marine production and the attainment of specialised skills, through learning and working stints at local firms.